The Alter Ego V2 is equipped to appeal to just about any player, whether you're well versed in vintage delays or not. Warm, tape-like repeats. 11 delays types in a small pedal. TonePrint presets. TC Electronic is rapidly becoming one of the premier names in delay and reverb, and the company's onslaught of ambience shows no sign of letting up. Hot on the heels of the Alter Ego X4 incarnation, the compact Alter Ego V2 Vintage Echo packs 11 delay types, including Pro Guitar Shop-tuned models based on classic tape and analogue echoes, such as the Binson Echorec 2, Boss DM-2 and Maestro Copykat. 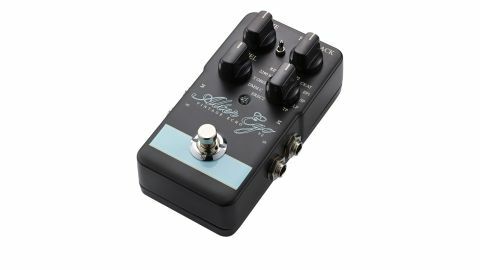 The pedal offers the standard array of delay controls - decay, tone, mix, delay type - plus a subdivision switch, which selects between quarter notes, dotted eighths and a dual-delay combination. "Also included is a single TonePrint slot for firing up sounds from TC's ever-growing library of preset"
It also boasts audio tapping, initiated by holding the footswitch down and strumming short 1/4 notes, while switching to the delay type control's LP setting activates the pedal's 40-second looper. Also included is a single TonePrint slot for firing up sounds from TC's ever-growing library of presets via the TonePrint app or a computer, or making your own using the comprehensive TonePrint Editor. In addition, you get stereo inputs and outputs, plus nine-volt battery and power supply operation, analogue dry- through and a choice of true or buffered bypass. If you've played the Alter Ego X4, you'll know exactly what to expect from the V2: you'll find warm, tape-like repeats from the Echoplex and Deluxe Memory Man models, crunchy decays courtesy of the Copykat and swirling detuned ambience from the Echorec and Echoflanger simulations, while new settings such as 2290 Mod and Reverse Mod add a touch of psychedelia to proceedings. Add in the easy-to-use 40-second looper, and it's hard to complain about the feature set on offer here. Although this pedal is more niche than TC's flagship Flashback Delay, it does what it does extremely well, and with the addition of a TonePrint slot, you can always have a more modern delay in your back pocket.